Be a partner in supporting the Chabad Center for Jewish Life. Please remember that Chabad does not charge any mandatory membership dues. We are completely supported by generous donations from kind hearted people like you, who understand the importance of investing in a Shul where everyone –regardless of affiliation or finances- is welcome to pray, to learn, and to celebrate their Judaism. We are registered with the IRS as a 501(c)3 Nonprofit organization. 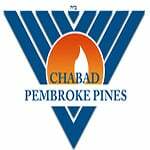 All donations to Chabad of Pembroke Pines are tax deductible. We do not receive any funding from Chabad Headquarters. All donations are raised locally, and every dollar you give is spent within our community. Your generous support helps us continue our vital work, to teach and inspire thousands of Jews of all ages, regardless of affiliation or finances. Click here to make an investment in the future of our local Jewish community. At Chabad we have an open door policy. Every Jew is already a member. We do not charge any mandatory membership dues. But since our bills come every month we depend on your voluntary membership to keep our doors open to everyone regardless of affiliation or finances. Click here to join the Chai Club and do your part to ensure our long term financial stability. The Shabbos Morning Kiddush has become a vital part of Chabad of Pembroke Pines. We are the Shul "where everyone is family", and the weekly Kiddush does much to create friendships, community and the warm, welcoming atmosphere in which we take great pride. Click here to sponsor a Shabbat Kiddush. Make a Memorial Dedication for a loved one. Advertise your business or practice on our website or in weekly emails. Blurb: Explore more creative ways of giving a substantial gift to Chabad. We can turn your old car, stocks, bonds and even real estate into a child’s Jewish education!